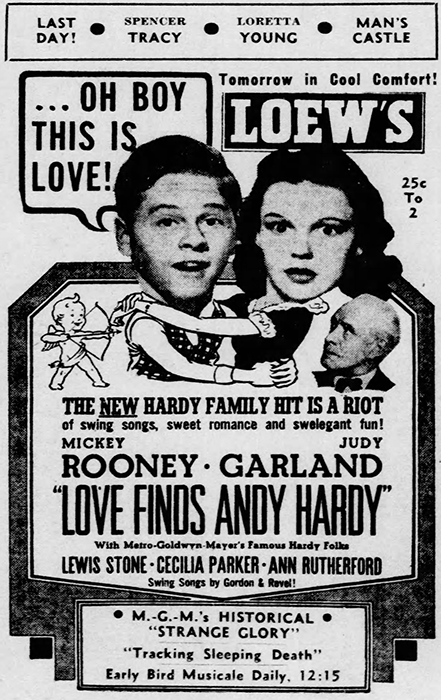 July 21, 1933: The second night of a week-long engagement for Judy, still going by her birth name Frances, at the Warner Brother Downtown Theater in Los Angeles, California. 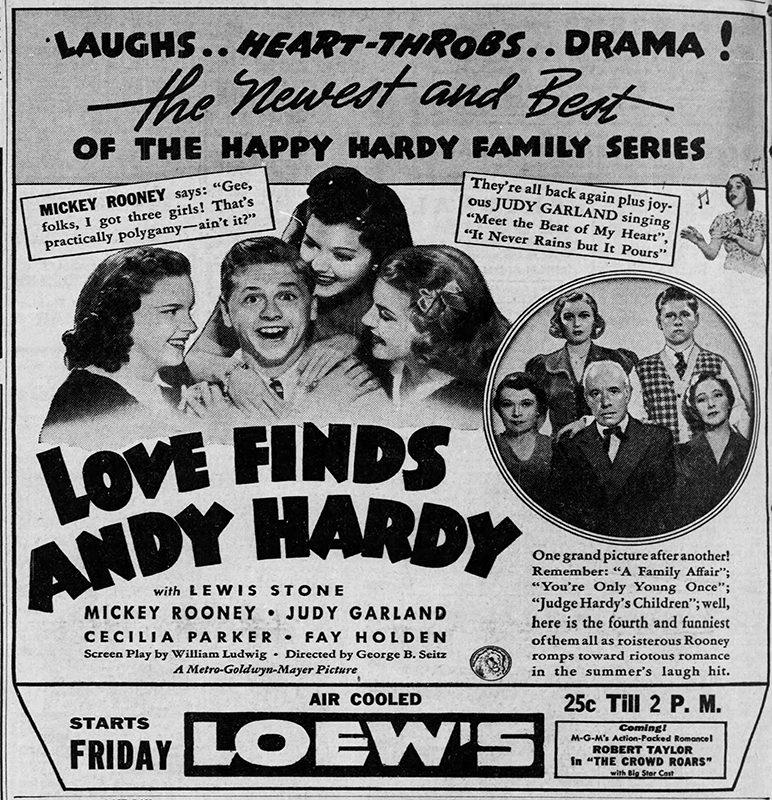 Judy is incorrectly billed as “Frances Gum.” This is the last time Judy’s name is listed in the ads for the theater. 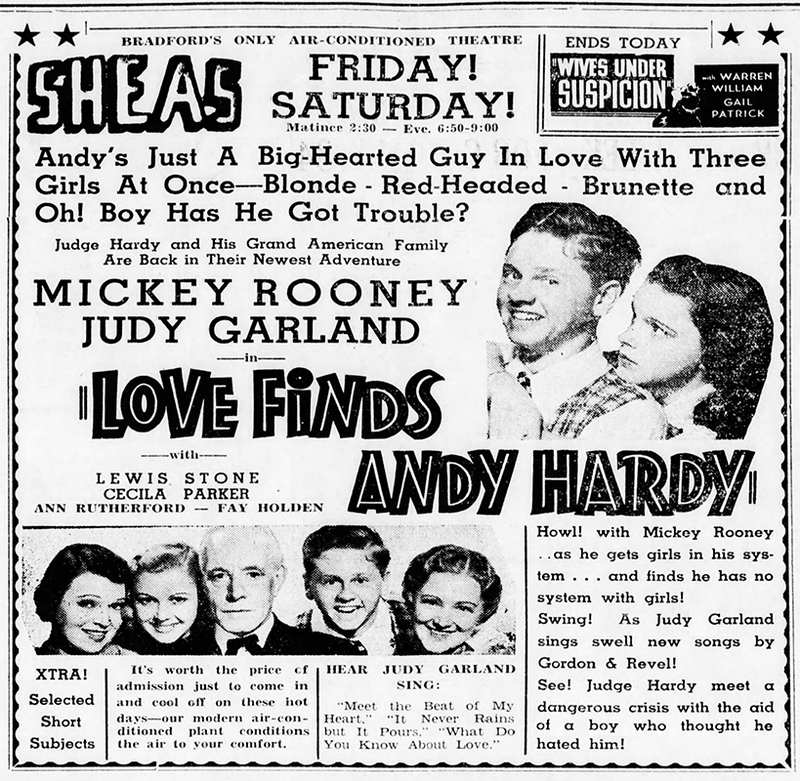 The Meglin Kiddies were a part of the same bill and since Judy was a part of the Meglin Kiddies it’s likely she performed with the group for the entire week, still singing a solo, even though she isn’t listed separately. 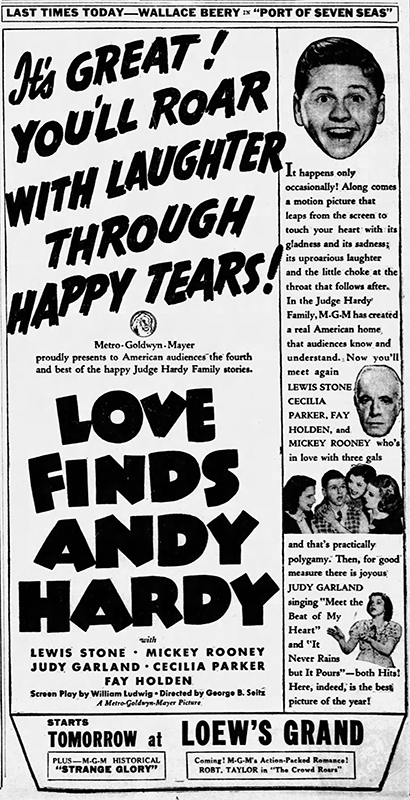 July 21, 1938: Here are some more fun ads for Love Finds Andy Hardy. 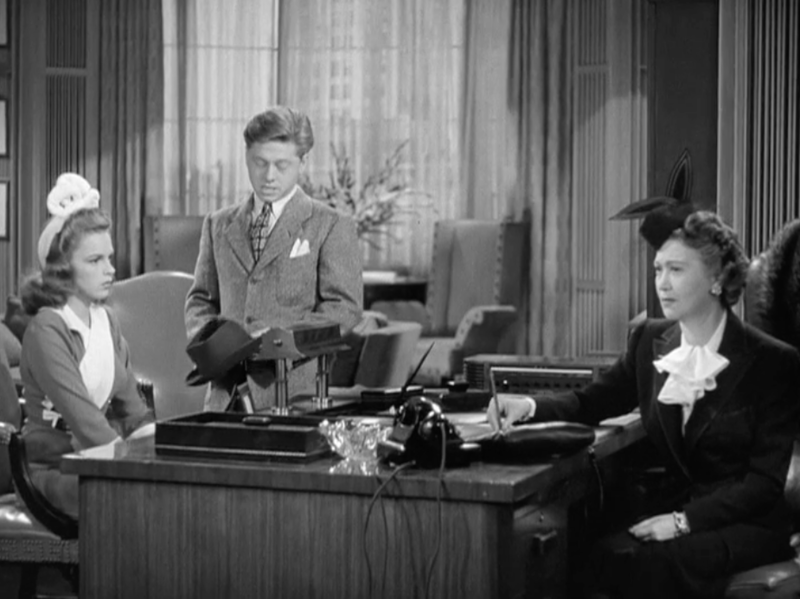 July 21, 1941: Babes on Broadway filming continued with scenes shot on the “Interior Jonesy’s Office” set. 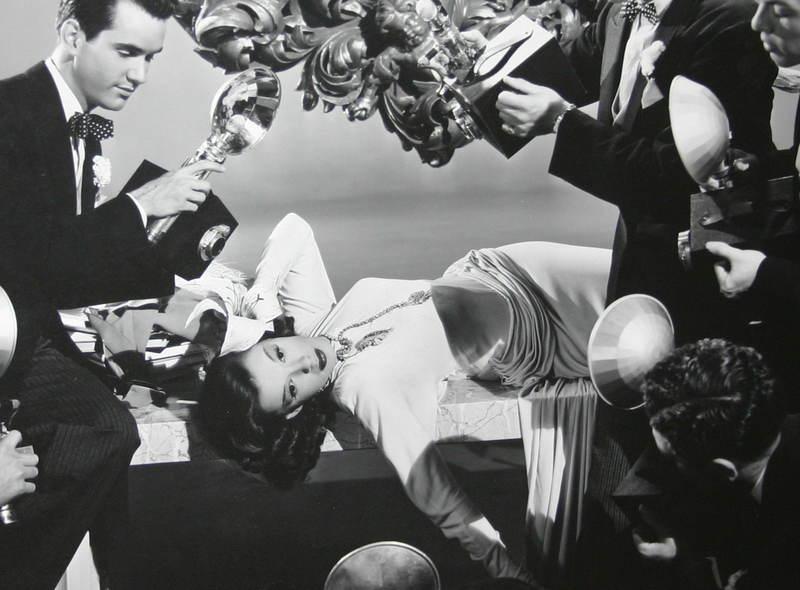 Time called: 3 p.m.; dismissed: 5:20 p.m.
July 21, 1944: The last day of filming “A Great Lady Has An Interview” for Ziegfeld Follies. Judy had a 10 a.m. call and was dismissed at 5:45 p.m. 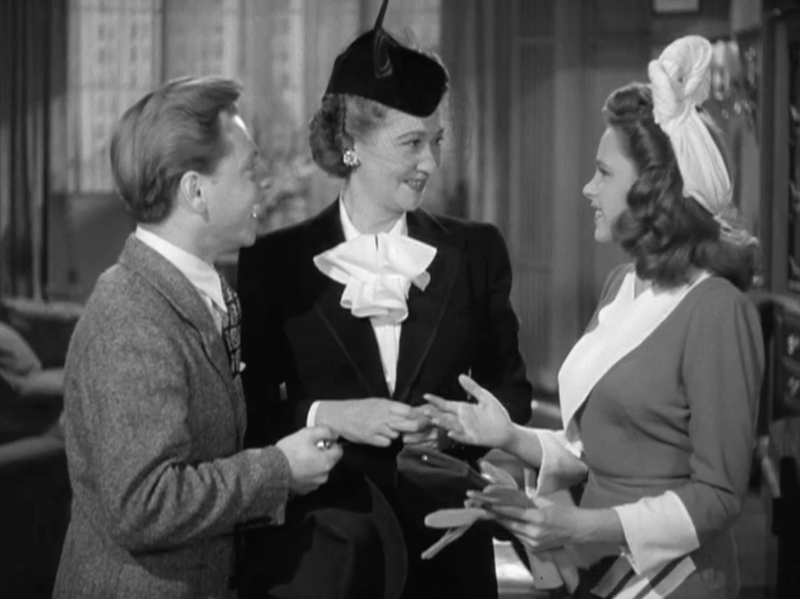 The total cost of Judy’s segment was $57,334.85. 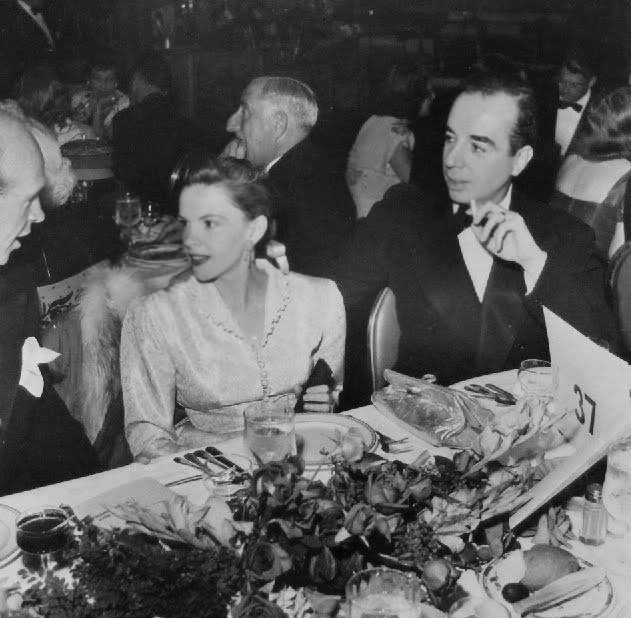 The movie had its first sneak preview on November 2, 1944, but then went through quite a lot of additions and deletions before its roadshow premiere on August 20, 1945, and then it’s general release on April 8, 1946, at which time it had been renamed Ziegfeld Follies of 1946. Luckily, Judy’s sequence survived all the edits. 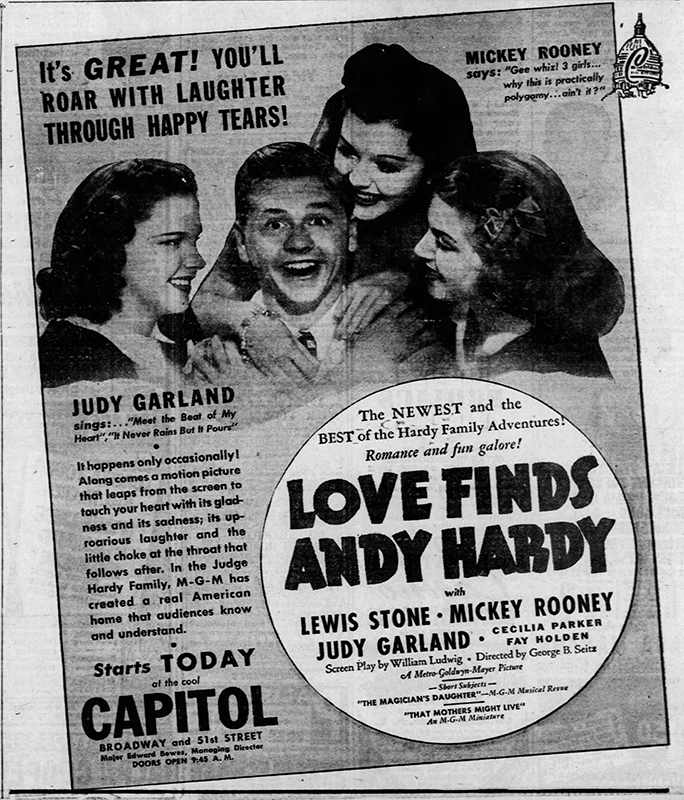 In fact, Judy performed part of the song in an early “rap” style that was very much ahead of its time, thanks to vocal arranger and coach (and soon to be a best friend of Judy’s), Kay Thompson. 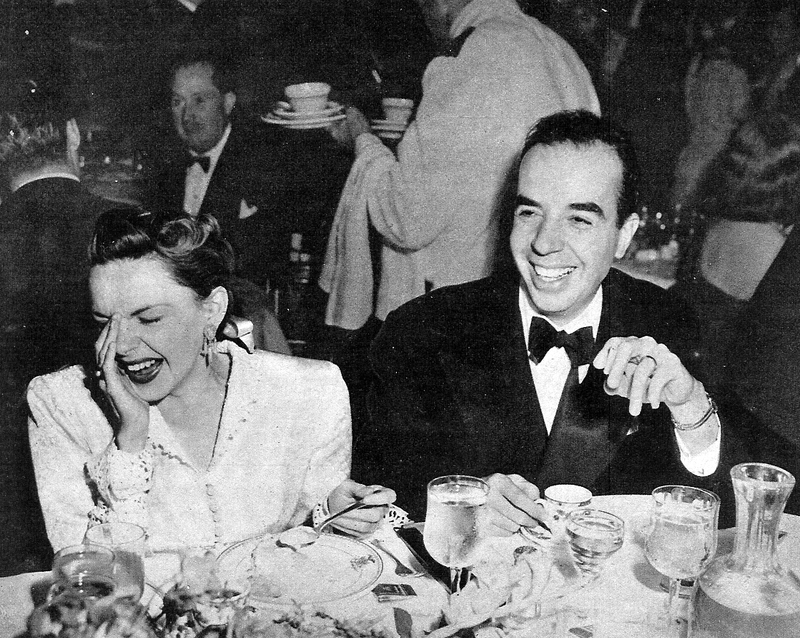 July 21, 1946: This photo featured in this series of photos was taken during a night out for Judy and husband Vincente Minnelli. 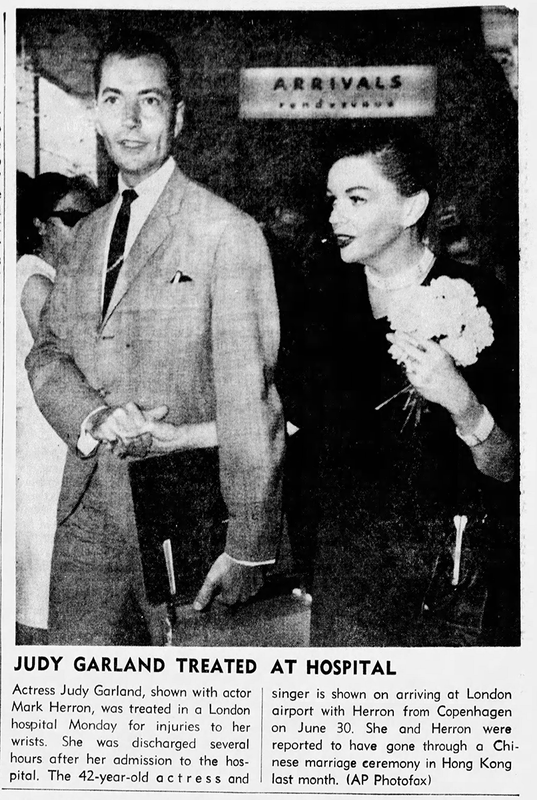 Judy had just given birth to daughter Liza on March 12th, so these photos were most likely taken in June or July. 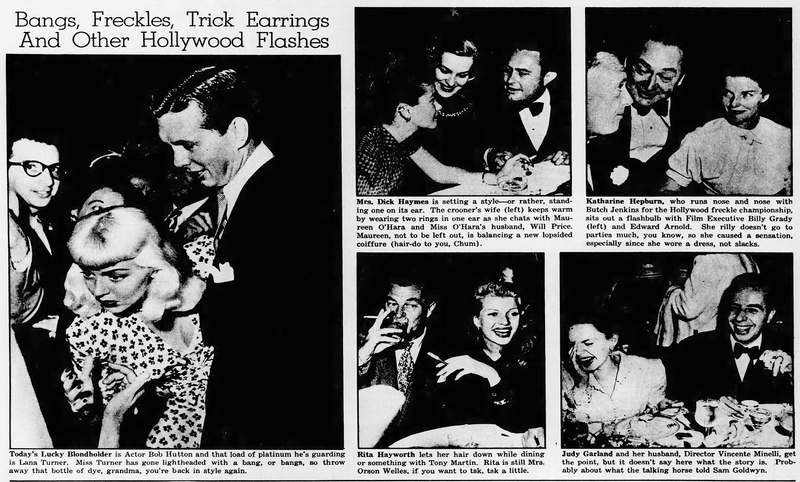 July 21, 1954: Filming on the “Born in a Trunk” number in A Star Is Born continued. 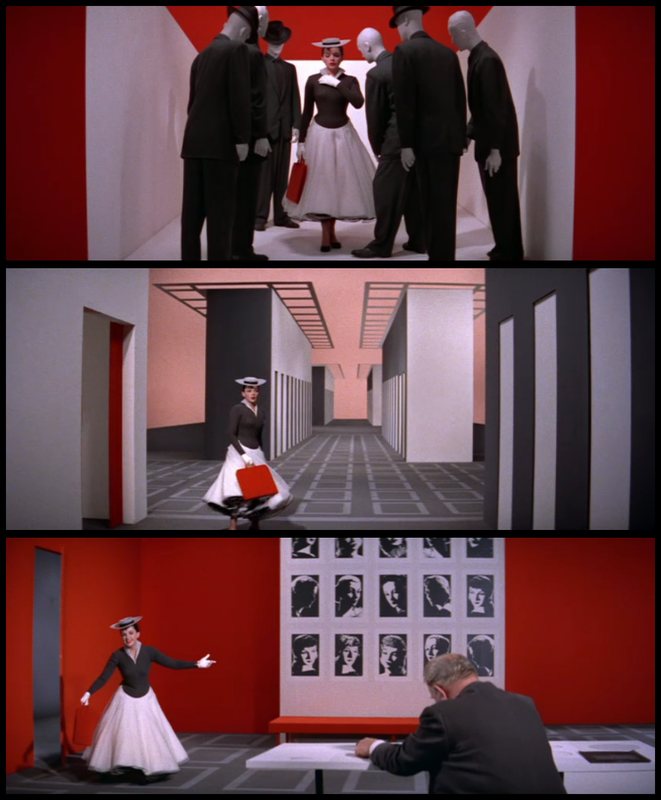 This time scenes on the “Interior Elevator”; “Interior Hallway”; and “Interior First Agent’s Office” sets. 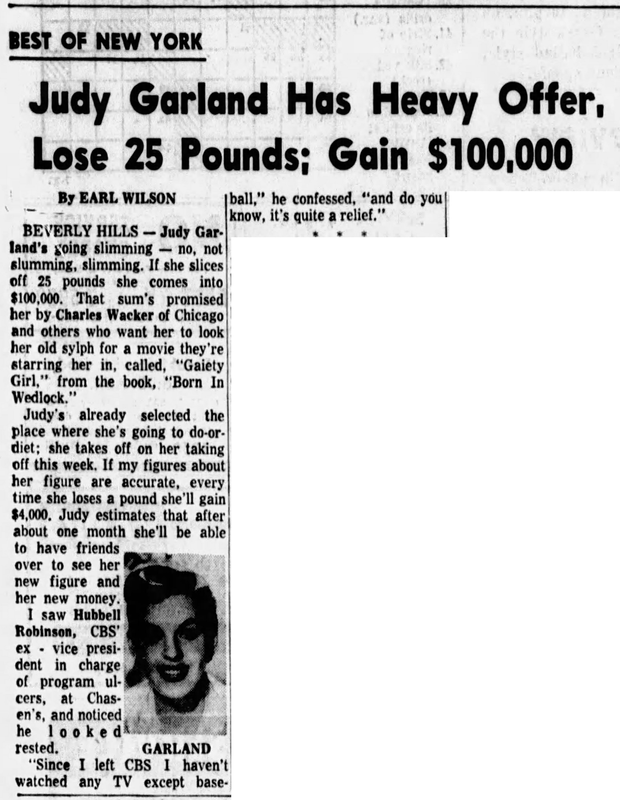 Time started: 5 p.m.; finished: 1:55 a.m.
July 21, 1959: Judy has a heavy offer! 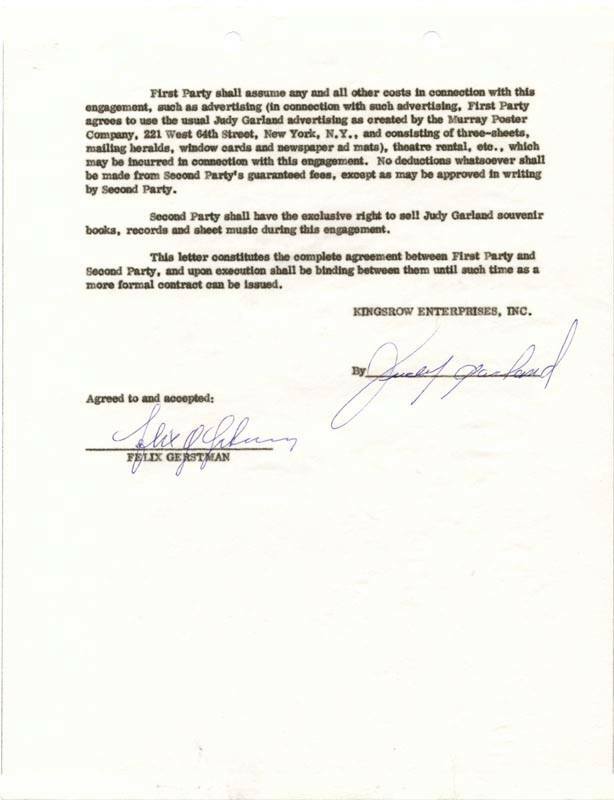 July 21, 1961: Judy signed (for Kinsgrow Enterprises, Inc. care of Freddie Fields Associates, Ltd.) this contract agreeing to bring “The Judy Garland Show” to the Westchester County Center on Bronx River Parkway at Central Avenue, White Plains, New York, on Friday, September 29, 1961, at 8:30 pm. 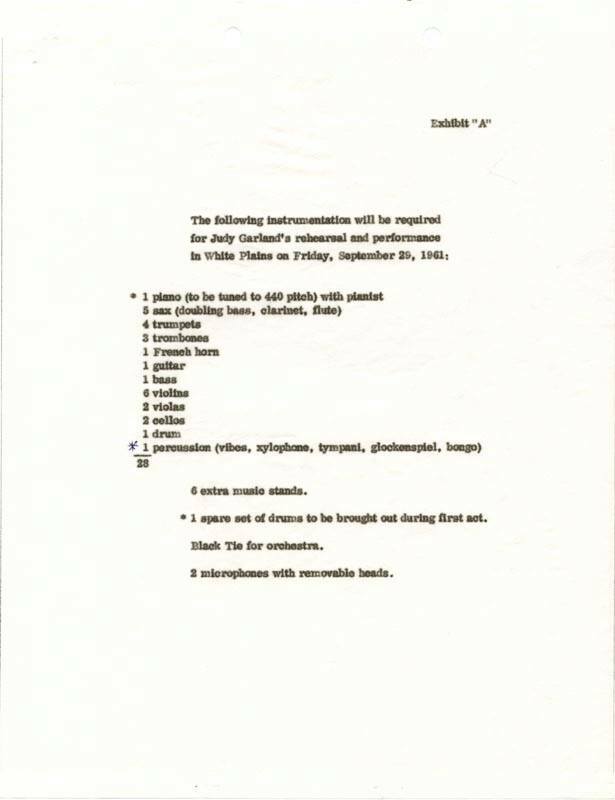 The document is accompanied by “Exhibit A”, which lists the equipment needed for the performance. 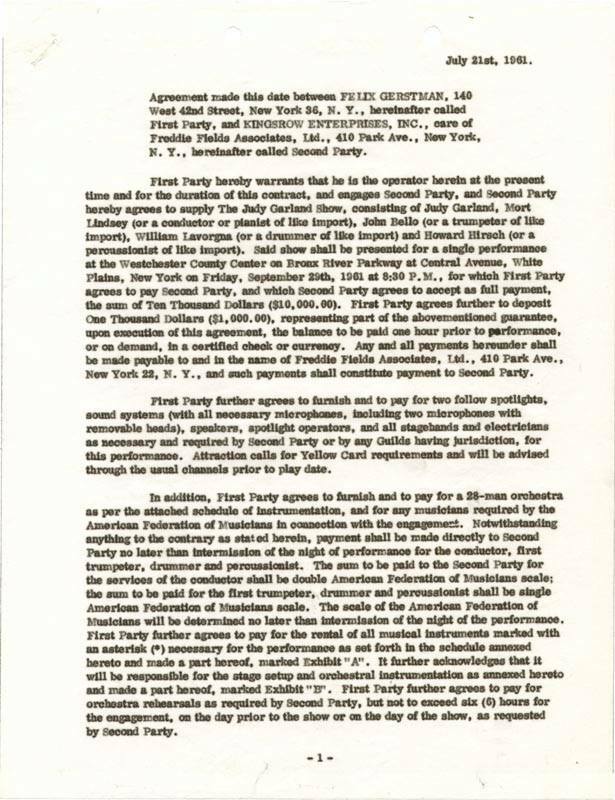 The sheet lists a piano tuned to 440 pitch with pianist, five saxophones, four trumpets, three trombones, one French horn, a guitar, a bass, six violins, two violas, two cellos, one drum and one percussion for a total of 28 instruments. 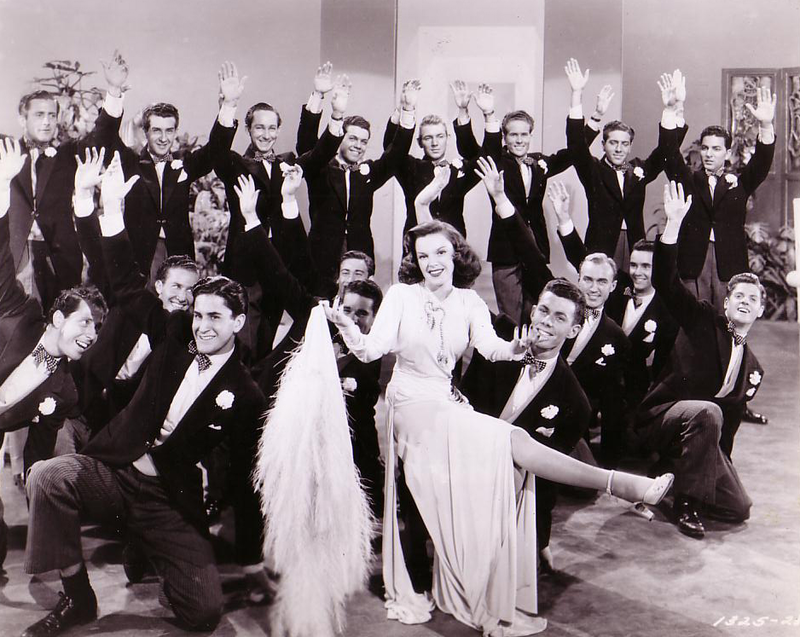 At lower portion, requirements call for six extra music stands, a spare set of drums to be brought out during the first act, black tie for the orchestra and two microphones with removable heads. 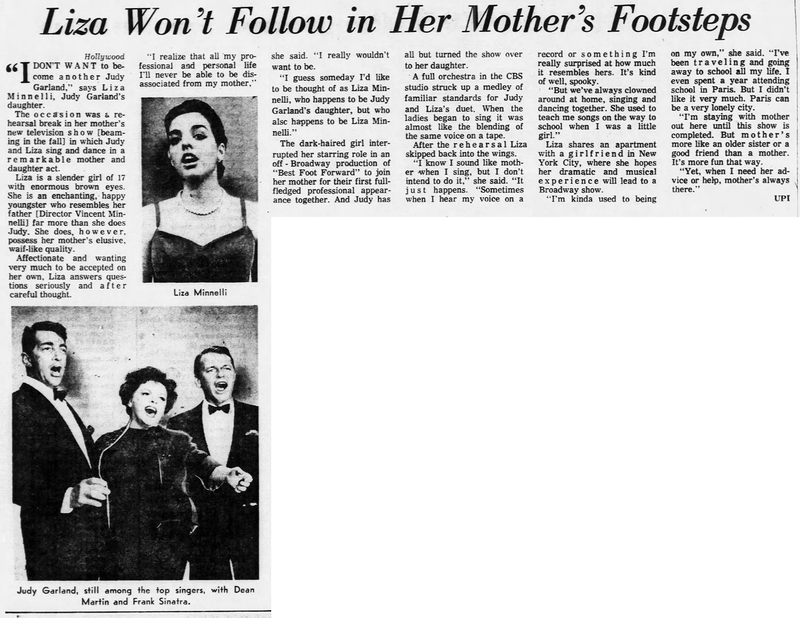 July 21, 1963: Judy’s daughter Liza Minnelli won’t follow in her mother’s footsteps. 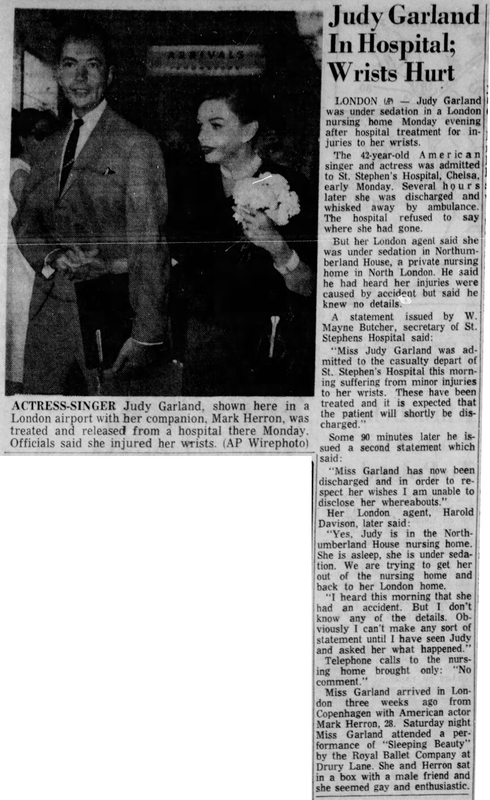 July 21, 1964: The papers were filled with the news that Judy had “hurt” her wrists in London, England, and was taken to the hospital where she was treated. 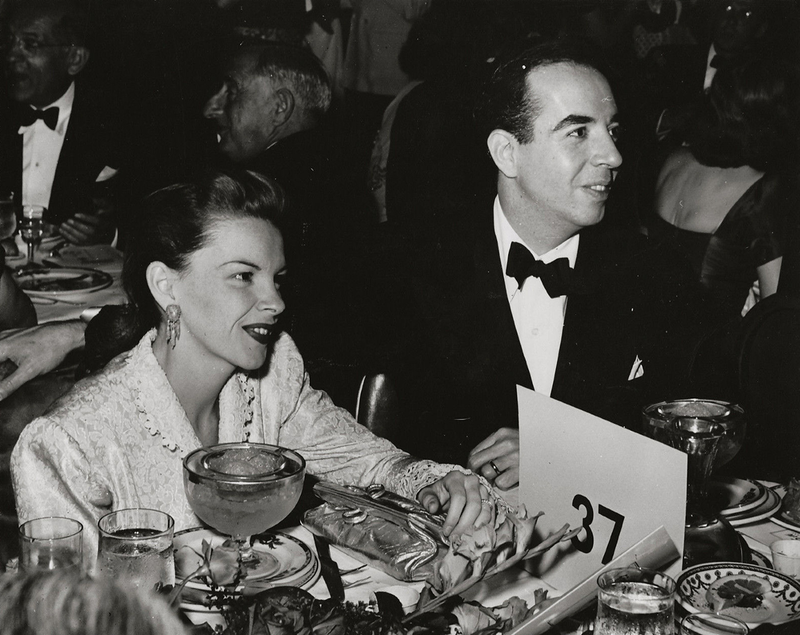 Her “traveling companion” Mark Herron accompanied her. The official story was that she cut her wrists from opening a trunk. 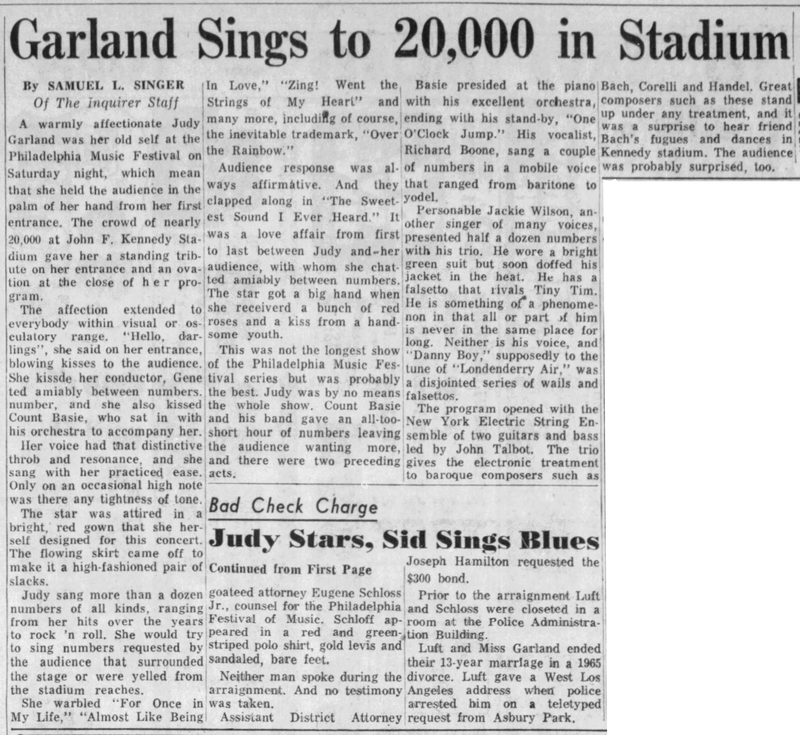 July 21, 1968: While Judy was wowing the crowds at the JFK Stadium in Philadelphia, Pennsylvania, her ex-husband Sid Luft was making headlines with his arrest for passing bad checks. 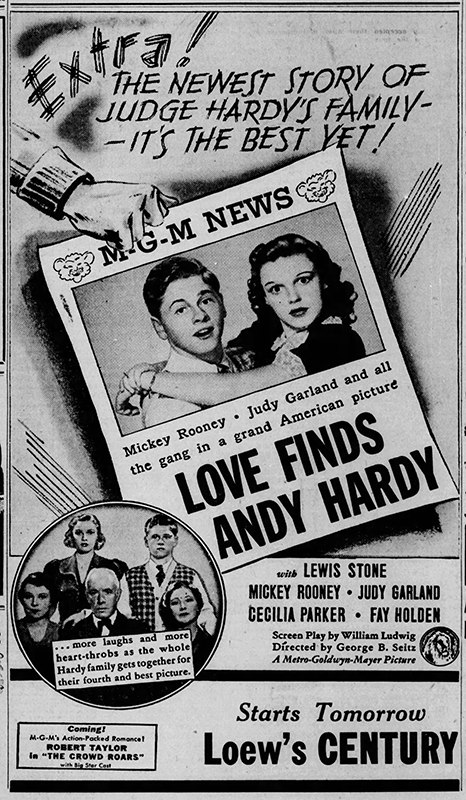 Included in the same paper this review of Judy’s show.